BATF: What exactly is milia? Dr. Schwarcz: Milia are tiny hard white cysts that are filled with keratin (hard protein like substance produced by the skin) Milia are found on the skin of people of all ages. BATF: What are some ways you can treat it? Any product recommendations? 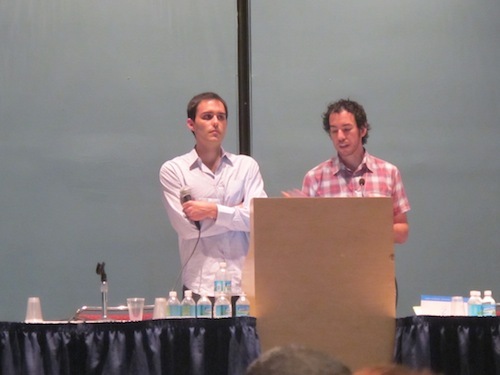 Dr. Schwarcz: The best solutions for curing this include (1) having a professional pierce each milium with a sterile lancet (a cutting instrument) or scalpel followed by removal of the cyst material with a tool called a “comedone extractor”; (2) topical retinoid cream such as tretinoin, tazarotene, or adapalene; or (3) a series of acid peels or microdermabrasion procedures at the dermatologist’s office. BATF: Can it only be removed by a derm? Dr. Schwarcz: No, aestheticians can remove them as well. If the milia is close to the eyelid, the patient should seek help from an ophthalmologist. They are treated by manual extraction with a needle, so it is important to be careful when especially close to the eyes. BATF: Will they come back once they’re removed? Dr. Schwarcz: They will not come back if properly removed. BATF: What are treatment/products he can recommend to reduce dark circles around the eyes? Dr. Schwarcz: It depends what it is causing the circles. Dark circles are usually caused from the shadow effect which is solved by either fillers or surgery. I have a lot of patients that come to me with this issue and every recommended treatment really depends on the severity of the problem. If it is increased pigmentation, it can occasionally be treated with a bleaching cream, but the cause tends to be genetic and is usually impossible to treat with bleaching cream alone. 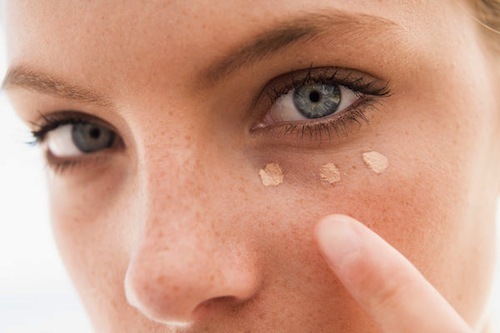 BATF: Do you have any favorite eye creams you can recommend? 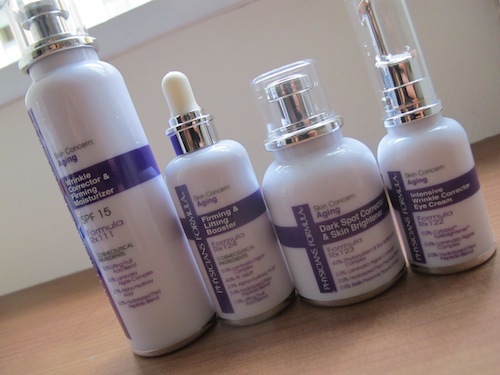 Dr. Schwarcz: Products I really like include SkinCeuticals and RoC eye creams. It never hurts to have a consult with an oculoplastic surgeon just to understand your options as creams alone will not remove dark circles. BATF: If you have milia, can you still use the same eye creams for fine lines and/or dark circles, or are there certain ingredients you want to stay away from? Dr. Schwarcz: Creams have no bearing on milia. Stay away from very caustic ingredients that remove too much of the top layer of skin though. Dr. Schwarcz does not recommend any products for milia aside from many the topical retinoids as they really do not work. For bleaching, prescription strength hydroquinone 4%. Hope this shed some light on the issue — did you find this helpful? if you guys have any more questions, please ask! 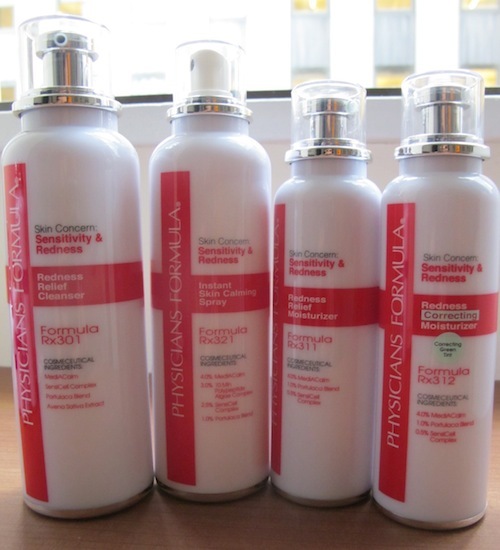 Physicians Formula new skincare line! The more I use Physicians Formula‘s products, the more in love I fall. They’re multi-tasking quality products that keep price point in mind. This past year has found me fawning over their Shimmer Strips bronzer-blush-shadow palette (it’s amazing for sculpting and adding a little depth — their makeup artist Joanna Schlip says she can’t live without it! ), their talc-free Mineral Wear pink correcting primer, and Eye Booster 2-in-1 boosting eyeliner + serum. Now, for the first time, the 74-year-old company is diving right into cosmecetical skincare which I’m predicting will be a game-changer in the “affordable skincare” category. Keeping their mantra to non-irritating, derm-tested products close, they’re come out with three mini-collections that address specific concerns: Aging, Moisture Balance, and Sensitivity & Redness. Hydrating & Balancing Moisturizer with SPF 15 – an oil-free moisturizer that replenishes skin hydration and eliminates flakiness and tightness instantly. Lightweight, non-greasy formula helps repair skin’s natural moisture barrier for more balanced skin long-term. Hydrating Eye Cream: Nutrient rich eye cream provides instant moisture, in a lightweight gel-cream formula. Diminishes the appearance of dark circles, fine lines, and puffiness. Ultra-Hydrating Day & Night Cream – Replenishes skin’s moisture balance and provides an extra boost of moisture day or night. Soothes even the driest skin to improve tone and texture leaving skin soft, smooth and hydrating. Just a note, I have been using the Day & Night Cream, and I wake up with my skin feeling like silk. I couldn’t stop feeling my face the next day! I’ve never been a huge fan of foaming washes, just because my skin needs a little more give (like gel or cream based cleansers), but the cream here is probably my favorite of the bunch. Redness Relief Cleanser – Ultra-gentle, lightweight cream cleanser melts away impurities without stripped skin of its essential moisture. Provides immediate relief to red and irritated skin, leaving it clean and comforted. Instant Skin Calming Spray – Lightweight mist provides instant soothing relief to dehydrated skin while reducing irritation on contact. Redness Relief Moisturizer – Extra-gentle, oil-free lightweight moisturizer instantly helps relieve redness and irritation, while providing all-day hydration. Restorative moisturizer soothes dry, itchy and flakey skin, while helping to strengthen and recondition it. Redness Correcting Moisturizer – Extra-gentle, oil-free lightweight moisturizer instantly relieve redness and irritation, while providing all day hydration. Correcting green tint delivers a sheer wash of color to instantly neutralize redness. Wrinkle Correcting & Firming Moisturizer – (with Alpha Hydroxy Acid, Hydrolyzed Pea Peptide Blend, and Lifting Fruit Acid Blend) Potent moisturizer instantly enhances skin’s firmness, hydration and radiance. SPF 15 protects against UVA/UVB rays. Improves the appearance of fine lines and wrinkles for an overall smoothing effect. Firming & Lifting Booster – Skin firming serum improves the appearance of fine lines and medium to deep wrinkles. Dark Spot Corrector & Skin Brightener -(with Phytonutrient and Soy Isoflavone Complex to reduce the appearance of dark spots without affecting the surrounding skin) Potent serum targets signs of uneven skin tone and helps address evident sun damage, dark spots, and dark patches and skin stresses. Antioxidant formula can inhibit the appearance of uneven pigment formation, keeping skin looking brighter and more uniform in tone. Deep Wrinkle Corrector Day & Night Cream – (with Laminaria Algae Complex) Ultra-rich cream enhances skin’s cycle of repair, encouraging healthy cell renewal to reveal younger looking skin. Helps improve moisture barrier, strengthen skin and protect collagen. Intensive Wrinkle Corrector Eye Cream – Potent cream targets the appearance of fine lines and wrinkles in the eye area. Moisturizing formula boosts elasticity and firmness to improve the appearance of crow’s feet and puffiness. Illuminating properties improve the appearance of dark circles. How much would you think products that claim this many benefits would retail for? I was shocked to find each product only costs $10-$19, and are available at Wal-Mart nationwide. Would you try any of them? 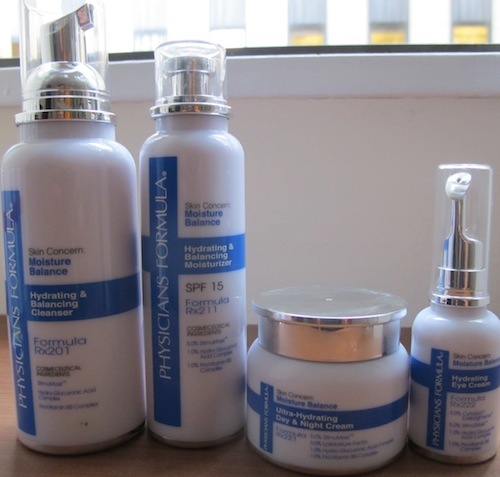 Do they address your skin concerns, or is there something missing? Fingers-crossed they come out with a acne-spot treatment! CHARITY - FOOD - "The Delicious"
I just hope to bring a little more attention in some small way to the gripping food and healthcare crisis in East Africa. The biggest drought they’ve experienced in 60 years has left millions (the latest estimate is about 12 million) desperately short of food and clean water. 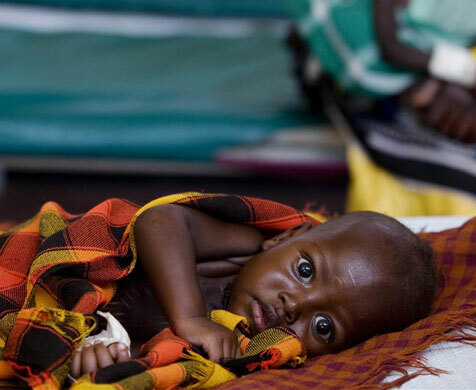 “Every day of delay in assistance is literally a matter of life or death for children and their families in the famine-affected areas,” says Mark Bowden, the U.N. humanitarian coordinator for Somalia. *To support UNICEF‘s relief efforts, text “FOOD” to 864233 to donate $10. *Save the Children launched The 100 Campaign. By raising $100 on your own or through social networks, you can feed one child for 100 days. Go online, give through the Facebook Cause page or text “SURVIVE” to 20222 to donate $10 from the United States. *The United Nations World Food Programme has plans to airlift high energy biscuits and highly nutritious supplementary foods for children and pregnant or nursing mothers into southern Somalia. Donations can be made from various countries online or by texting “AID” to 27722 donate $10 from the United States. *Islamic Relief has been responding to the efforts by providing food aid, nutrition, health, water, sanitation and hygiene, agriculture and livelihoods. To donate, visit their website. *Also, if you work for a corporation, try seeing if they have some sort of Matching Charitable Gift program where they will match funds you provide for an equal amount for the cause. It’s worth looking into as a way to easily double the amount you’re hoping to contribute. If you guys know of any other great ways to contribute, whether it’s through your company or another organization, please list them below! I was fortunate to meet them during my trip to Miami. They are Very Important People at cracked.com. They even gave a speech with a Powerpoint about the awesomeness of the site (for example, did you know Cracked.com has one of the most engaged audiences? More than Comedy Central, FunnyOrDie, and The Onion combined? Now you know). 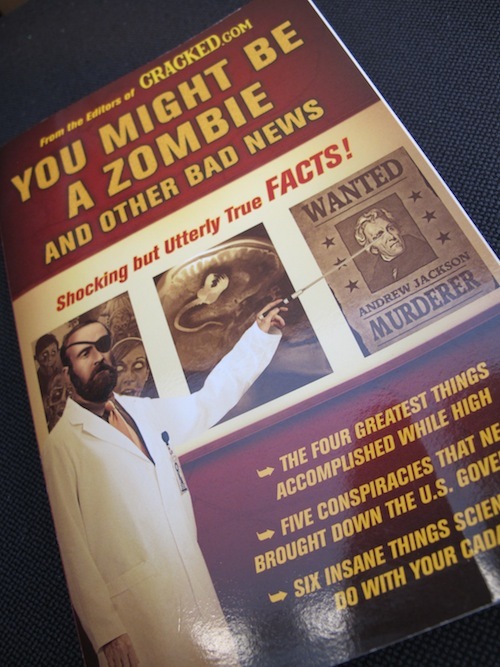 After their speech, they were signing copies of You Might Be a Zombie and Other Bad News: Shocking but Utterly True Facts. I’m pretty sure it was the longest line of ladies that conference saw all weekend, but for some reason or another when I got to the front I never got my copy of the book (I think the guys were too engrossed with talking to the fans :)). 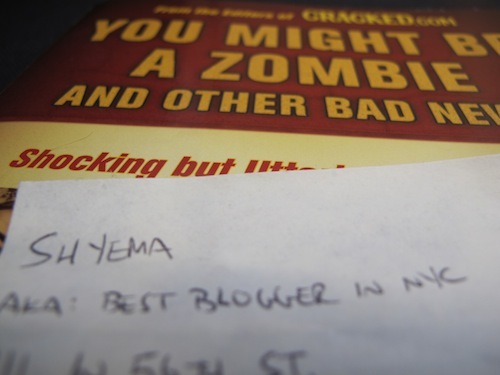 I saw them later as they were just leaving for the airport and told them how I really wanted a book and totally waited in line for it, so Oren promised me he’ll send me something better: a signed copy of the book from the ENTIRE staff of Cracked.com. And lookey what I got in the mail! I'm pretty sure he meant 'in the world' which is so sweet of him! 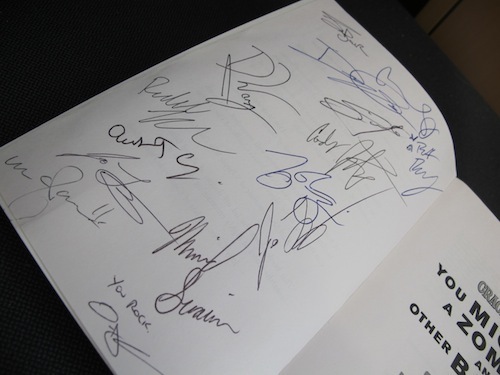 So basically, I just wanted to give a giant THANKS to Oren for sending the book (I’m sure the rest of the staff was entirely confused but they were nice enough to sign it anyway — I feel really special :)). And you guys should pick up a copy too, it’s a really funny (and enlightening) read you’d expect from the editors of Cracked: The Four Most Badass Presidents of All Time, The Six Cutest Animals That Can Still Destroy You, The Six Most Depressing Happy Endings in Movie History…or the chapter I could barely stomach: The Six Most Terrifying Foods in the World (spoiler: balut from the Philippines are “duck eggs that have been incubated, often until the fetus is feathery and beaky, and then boiled alive.” Terrifying.). I’m totally going to use the book to learn all this random trivia and show off at the next party. Yes, I’ll be THAT person. Thanks again to everyone at Cracked.com! You guys rock! A couple weeks ago was one of the first times in a while that I went to an Indian restaurant. It’s not that I don’t like the food of my peoples (au contraire, I love), it’s just that I don’t really think about going to a restaurant to getting my hands on some chicken tikka masala. But you know, I live away from home, and (clearly) I don’t make enough time to cook at home. 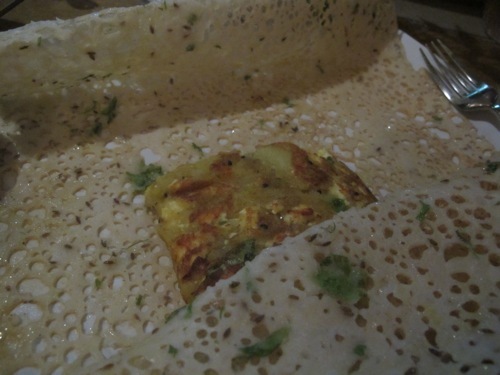 When my friends suggested we get dosas for dinner, I was game for once so we headed over to Tiffin Wallah in “Curry Hill” (that’s a totally non-official name for you non-NY’ers, but it refers to the desi-restaurant laden area of Murray Hill). We broke fast with papri chaat (crisp fried dough, chick peas, tamarind sweet yogurt and date chutney) kinda like how I would at home (did I mention I miss home?). 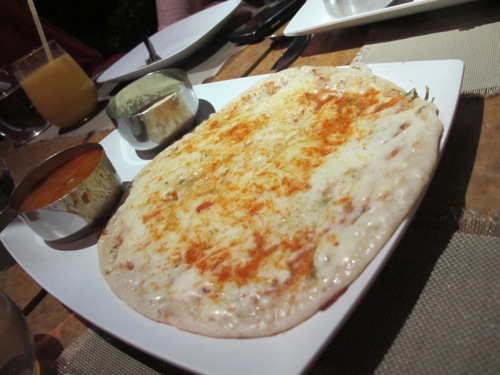 My friend Miral ordered some Indian naan-pizza thing which we can’t remember the name for the life of us…I think it was the Chili+Cheese Dosa they have (they say it’s their version of a quesadilla and that sounds about right). 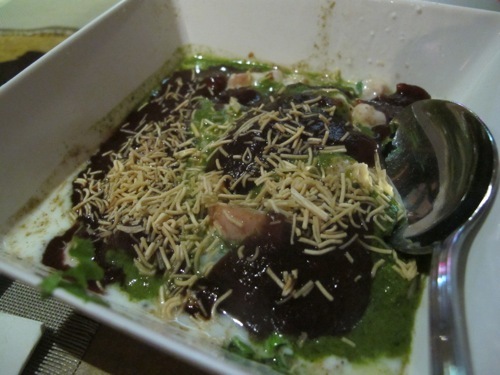 The rest of us ordered masala dosas, only I got the paneer masala one. 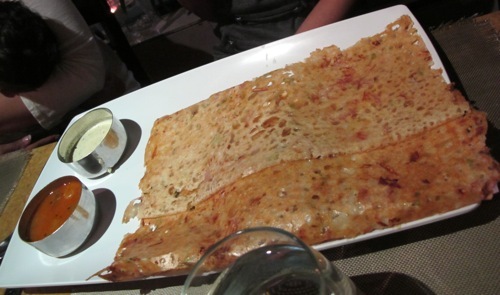 I will say that the masala dosas totally trumped my paneer one (paneer is an Indian cheese, by the way). I couldn’t really even taste the cheese so it didn’t really do much for me. I enjoyed the food, but I will say I think I slightly prefer the chutneys you’d get at Saravana. 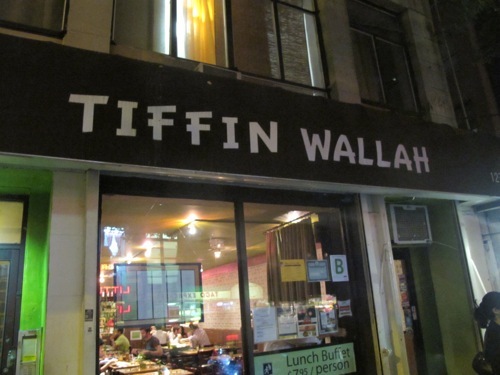 For what it’s worth, we didn’t smell like tiffin walle after our meal so I guess that should account for something.